I have always embraced an entrepreneurial spirit. As a kid in the 1970’s, I tagged along with my parents to craft shows on the weekends where they made and sold hand-stamped leather belts to earn extra income and I made macrame necklaces and sold those too. When I was 14 I told my dad I wanted to be a stewardess when I grew up, he said “Why not be the pilot? Be the captain!” and gave me some flight lessons for my birthday (I discovered I get air sick very easily, so did not pursue that dream for long!). I was always thinking about ways to earn income – not to get rich, but to have the validation that I created something of value to others. Fast-forward to a time after my first child was born. My career in advertising and marketing introduced me to tools, techniques and jargon that are still valid today, but “working for the man” was never a truly satisfying experience for me. Thankfully, my husband had a salaried job with benefits, and since he traveled a lot for work, we decided that I would stay home with our son. When I left my marketing job, my boss suggested I start a little business selling illustrated prints I had become known for around the office, having given them as gifts to my co-workers when they had babies. With that idea in mind, I started gradually spreading the word among my new “mom” friends, and before I knew it, about 5 years later, with a second child and a wonderful network of moms, I had a full-fledged stationery business, TLC by TARA, that allowed me to work from home and take care of my kids. My income was low, but grew over the years until it covered piano lessons for my children and a car payment on an awesome blue Dodge mini van! More importantly, this “accidental” career allowed me to broaden my identity and skill set without even intending to. It introduced me to wonderful friends and fellow entrepreneurs, and satisfied that craving for validation, connection, and a little bit of income. The business began before the internet was “a thing” and before computers were widely used. By 2003, however, I began to explore digital tools and built a website for my business using Microsoft Front Page. I uploaded hundreds of illustrations and laid them out in html tables. I fell in love with technology and eventually decided to stop making stationery. 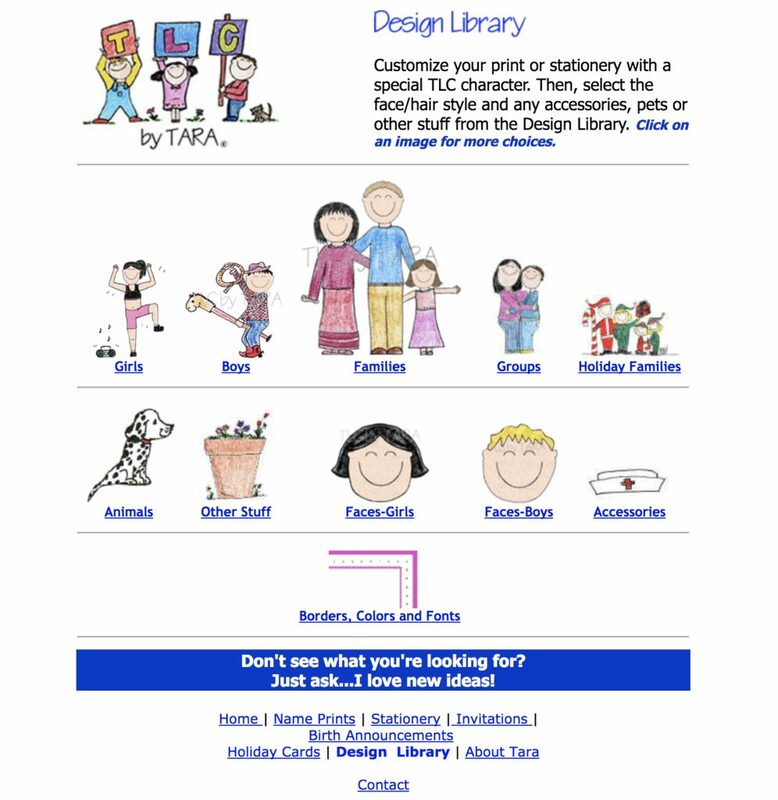 I got rid of my industrial printer, paper cutter, paper, and supplies and changed my business name to Design TLC to focus on graphic and web design. I had heard about WordPress and volunteered to build a new website for my neighborhood association and a local women’s cycling group to check out the platform, practice and learn. I taught myself how to make custom child themes and combined that with my marketing background to create websites for a number of small local businesses. It wasn’t until 2014 that I discovered the WordPress community. I heard about “WordCamps” and found one near me, in Baltimore, Maryland. By chance I sat at a lunch table with two strangers who I later learned were quite well known in the WordPress world – Chris Lema and Shay Bocks. They were so friendly and supportive, answering my many questions and offering tips and advice that changed my approach to website design and to running my business. I still think back to that experience as transformative; having lived in a bubble for the first years of working with WordPress, it was eye-opening to discover its community and resources. I quickly started absorbing everything I could about WordPress. I live-streamed WordCamp San Francisco in 2014, and joined Slack and Facebook groups. I started listening to a ton of WordPress podcasts and attended WordCamp Philadelphia and WordCamp New York City. I began attending the DC WordPress Meetup, where eventually one of the organizers encouraged me to speak about Genesis for a lightning talk. I couldn’t believe I was suddenly in a position of authority – sharing my knowledge with others when I felt like everything was still so new to me. Like many in our community, I am plagued by imposter syndrome. Relative to many, I am still new to WordPress and I am not a trained coder/programmer. I am also self-consciously older than many people I meet, and still sometimes think of myself as a “Mompreneur.” I am constantly making choices about what to learn next and where to focus my time and resources. Most importantly, I think about how I can run a business while also giving back to the community that has welcomed me and given me so much. I love the mission of HeroPress – giving a voice to others like me, who may often feel insignificant but whose lives have been inspired and enhanced by the WordPress community. With this vision in mind, this year Liam Dempsey and I started the podcast Hallway Chats, where we introduce and talk to people who use WordPress. Like HeroPress, we hope these stories inspire someone else who in turn will keep the cycle of sharing and encouragement going! 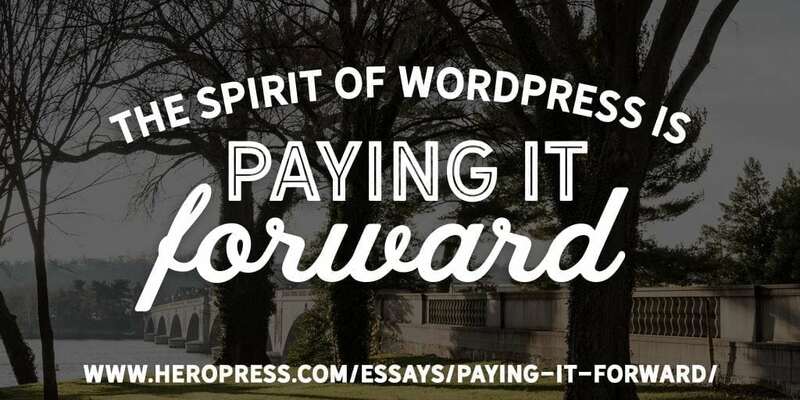 The spirit of WordPress is “paying it forward” and I think that is the best kind of payment there is. The post Paying It Forward appeared first on HeroPress.